NORMAN – For the fourth time this season, the No. 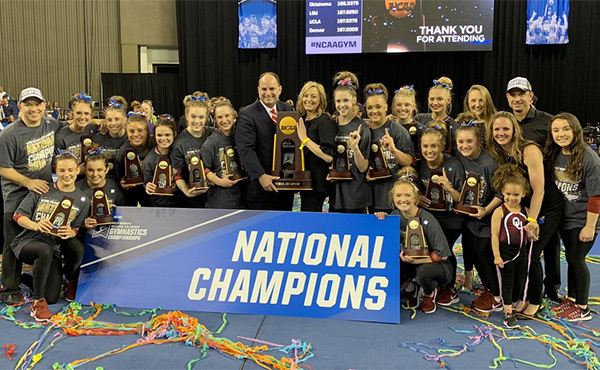 1 Oklahoma women’s gymnastics team posted a mark of 198 or higher, dominating West Virginia, 198.025-195.750, Friday night at Lloyd Noble Center. 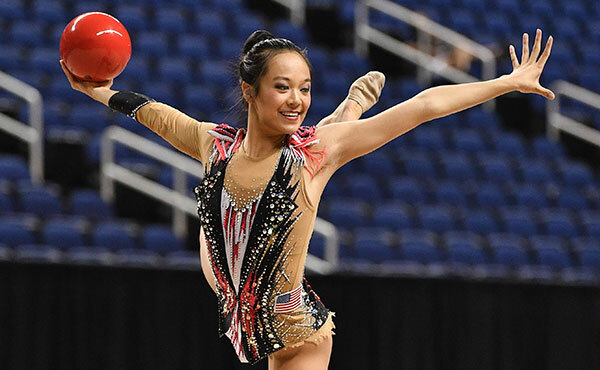 ATHENS, Ga. — Four GymDogs set career-high scores on beam as the No. 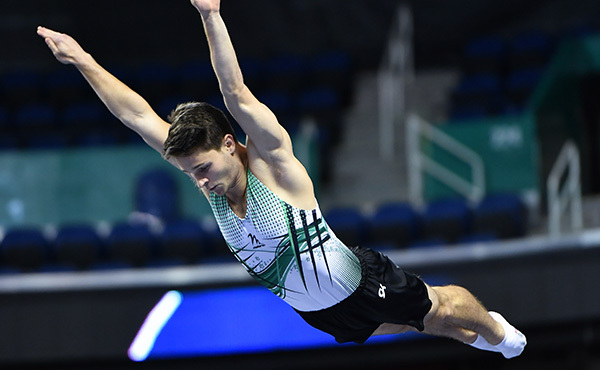 15 Georgia GymDogs fell to No. 2 LSU, 197.575 to 196.725, on Friday night in Stegeman Coliseum. LOS ANGELES - Showtime hit Pauley Pavilion on Sunday, as No. 3-ranked UCLA put on a clinic on balance beam and floor exercise en route to a season-high total of 198.075 in a dual meet win over No. 8 Oregon State, who scored 196.525. BERKELEY, Calif. - For the first time in the history of the program, California earned a regular-season victory over the perennial powerhouse Utes. 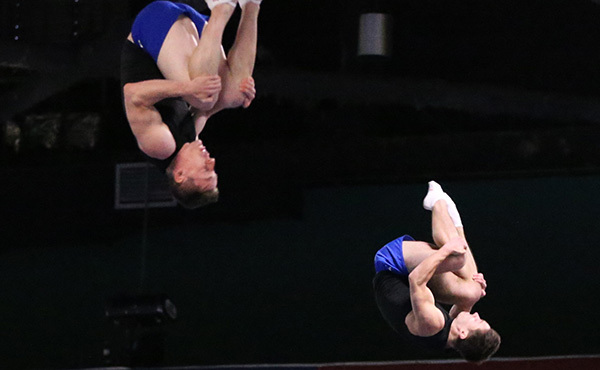 Cal used a program-record 197.500 performance to upset the Utes, who went 197.450. GAINESVILLE, Fla. - The Gators took the win tonight at 197.725, which stands as the nation's 10th highest mark of 2018. Arkansas turned in its high road score of 196.875. TOLEDO, Ohio -- For the second straight week, the No. 6 University of Michigan women's gymnastics team rallied in the final rotation for a win, this time coming back to tie No. 12 Denver for the top score at the Elevate the Stage meet at Sea Gate Centre on Friday (Feb. 23). AUBURN, Ala. – The No. 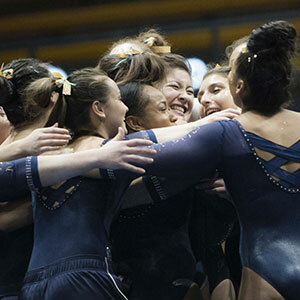 12 Auburn gymnastics team scored a 195.4 in its final home meet of the season in Auburn Arena, falling to No. 6 Alabama’s 197.3. LEXINGTON, Ky. – The No. 9 Kentucky (6-4, 3-4 SEC) posted a score of 197 or above for the third time in program history tonight as UK took down No. 20 Missouri, (3-6, 1-5 SEC), 197.100 -195.125 inside Memorial Coliseum on Friday night. SEATTLE – The #10 Washington GymDawgs had a triumphant return home, defeating the #22 Stanford Cardinal 196.475-195.450. PROVO, Utah ­– Senior Kyleigh Greenlief received a career-high 9.950 on floor while Shannon Hortman Evans posted a career-high 9.900 on bars, edging No. 18 BYU ahead of No. 13 Boise State 196.225 to 196.175 on Friday night in the Smith Fieldhouse. LINCOLN, Neb. – No. 14 University of Nebraska women’s gymnastics topped Pittsburgh on Saturday night in the Devaney Center 196.425 – 193.600 in the annual Power of Pink meet for breast cancer awareness. TEMPE, Ariz. – The No. 17 Arizona State women's gymnastics team (6-4; 3-3 Pac-12) captured a pivotal Territorial Cup point in a wire-to-wire, 196.725-195.025, victory over in-state rival Arizona Saturday at Wells Fargo Arena. AMES, Iowa - The No. 25 Iowa State gymnastics team recorded a 195.775 en route to sweeping the competition on Friday night at Hilton Coliseum. CHAMPAIGN, Ill. – The University of Illinois women's gymnastics team posted a 195.400 team score, good for a second-place finish in front of over 1,700 fans at Huff Hall on Sunday afternoon. NORMAN — Every week, the Sooners somehow find a way to top themselves. 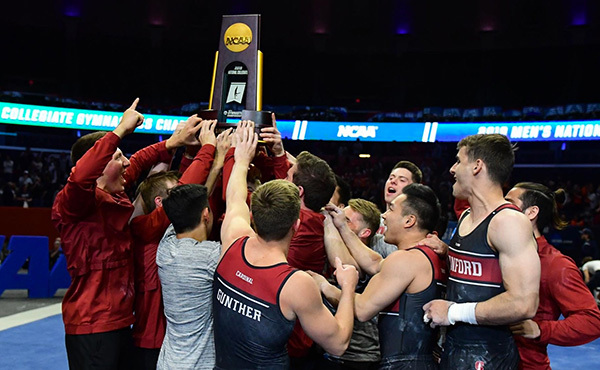 In their meet against Navy, the OU men's gymnastics team became the first team this season to pass the 420-point mark and posted the best score in NCAA for the third straight competition, winning 429.550-401.300. UNIVERSITY PARK, Pa. - In the midst of "We Are" chants and the chaotic double-dual atmosphere, the Penn State men's gymnastics team maintained its cool throughout a close bout and an even narrower finish. IOWA CITY, Iowa -- The No.10 University of Iowa men's gymnastics team won five event titles as it fell to No. 5 Nebraska, 398.500-402.800, on Friday night at Carver-Hawkeye Arena. 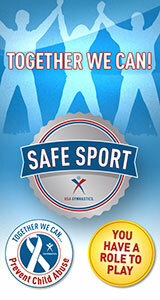 CHAMPAIGN, Ill. - The Fighting Illini men's gymnastics team defeated No. 8 Michigan, 405.200-394.900, on Saturday night at Huff Hall. WEST POINT, N.Y. – The Army West Point gymnastics team won big on senior day Saturday with a team score of 385.000. 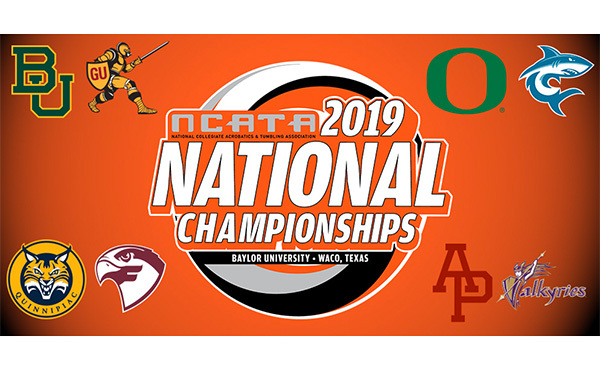 WACO, Texas - In a rematch of the last three NCATA national championships, the three-time defending national champion Bears (4-0) won five of the six events, tied in the other and defeated No. 2 Oregon by a comfortable margin (284.725-280.830) Saturday night before a Ferrell Center and NCATA-record crowd of 2,346. PHILIPPI, W.Va.—The Alderson Broaddus acrobatics and tumbling team fell to the Quinnipiac Bobcats 280.235-264.990 in its first home meet of the season on Saturday afternoon at Rex Pyles Arena. BRISTOL, Tenn. – The King University acrobatics & tumbling team took on the Golden Knights of Gannon University for their first ECAC meet. The meet was close in the first half, but the Golden Knights pulled away in the second half to take the win 271.650-253.830.